Too much exertion is most definitely a bad thing, especially when you are on holiday. 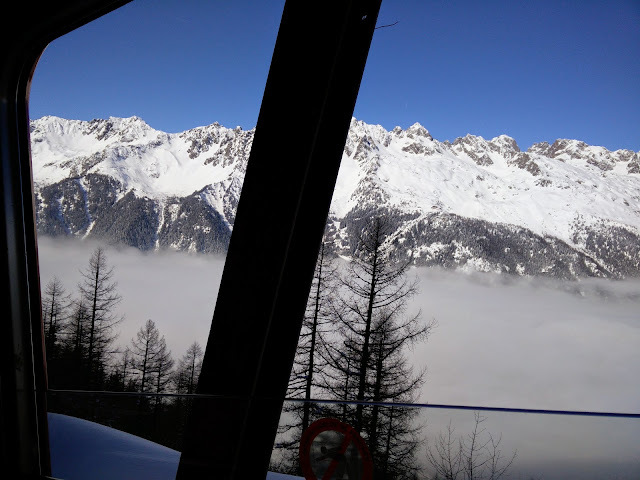 Having walked endlessly in Barcelona only to then go straight out and snowshoe upon my arrival in Chamonix I was keen for a more restful experience. As it happened on my second day most of the family were also keen for a less taxing form of entertainment. Chamonix is surrounded on all sides by high mountains and as a result it has a fair few glaciers. 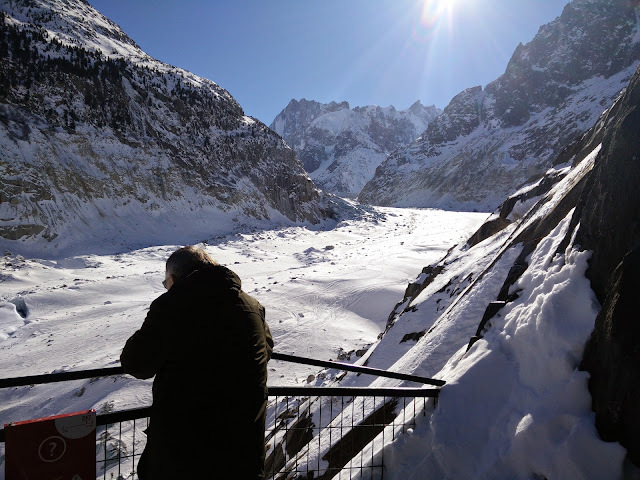 Normally reaching a glacier is quite hard, but fortunately in Chamonix somebody built a railway line up to the Mer de Glace glacier. 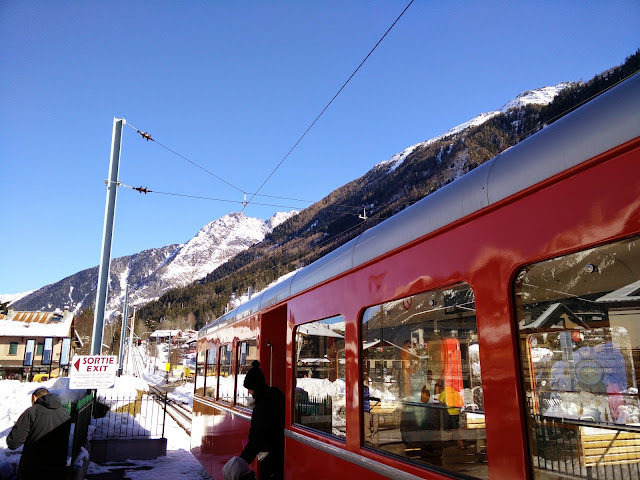 The Montenvers Railway climbs nearly 1,000 metres in the space of 3.2 miles, utilising a clever cog and rack system to aid its passage on the steeper sections. Amazingly the line was opened in 1909, back when people had so much money that they could spend it on fancy nonsense. Like a railway line up a mountain. The Montenvers Railway station in Chamonix. Getting to the station and actually boarding a train proved to be just as challenging as I expected. We were a party of 7, including our 2 year old niece, and we also had to locate Claire’s brother and his wife who were staying at a hotel in town. After some searching and coffee drinking we boarded the train around lunch time. The journey up the mountain is really impressive. The engineering aspect of the train is admirable, with viaducts, cuttings and a tunnel through what is clearly very challenging terrain. This is the sort of thing that really impresses me when I travel. I have limited appreciation for paintings and fancy churches, but an impressive feat of engineering will always draw me in. 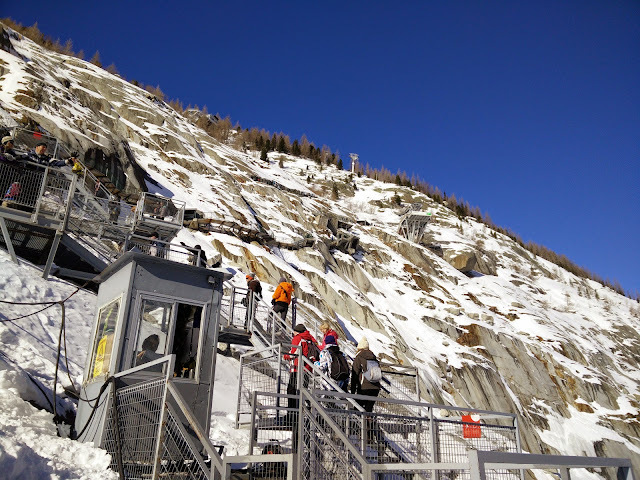 At the top of the line awaits the railway station and the Grand Hotel du Montenvers. Interestingly at the time the hotel and the railway station were built they sat just above the glacier. Now, some 100 years later, the glacier has reduced in size so much that it takes a cable car and a hell of a lot of steps to climb down to it. As we descended we saw signs on the rock indicating where the glacier had been going back 10, 20, 30 years. We saw much the same thing at the Glaciers in New Zealand. It is a striking way to come to appreciate the effect of climate change. …and now. This photograph is taken from the location of the building in the picture above. 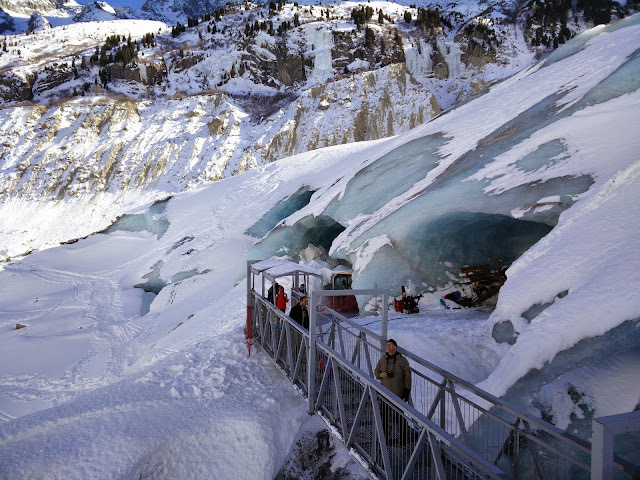 Down at the bottom of the steps it is possible to go inside man made caves that have been hollowed into the glacier. This amused me as it was immediately apparent what a royal pain in the arse this must be for the people digging out the cave. The glacier, and all other glaciers in the world, are in constant motion. The sheer weight of their icy mass enables them to slide slowly downwards, carving out valleys and moving huge amounts of rock. The Mer de Glace is a particularly speedy glacier, moving at 1cm per hour. Which explains why men were hard at work digging a new ice cave, presumably to put into use once the current cave moves on down the valley and away from the stairs and cable care. Being an ice cave digger in Chamonix could must be a soul destroying job. 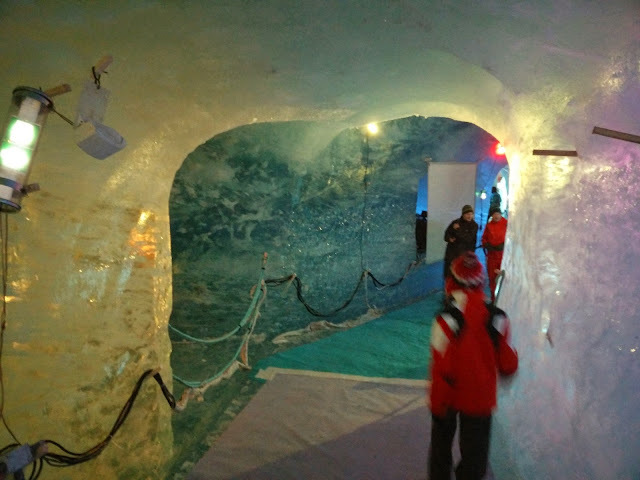 The entrance to the ice cave. Note the other caves, now abandoned as they move away. Interestingly, as the glacier melts at it’s lowest point things will often appear, having been carried in the glacier from top to bottom. When we were in New Zealand we read about a climber’s body appearing many years after going missing. The Mer de Glace glacier is the largest in France, flowing for 7km and with an astounding thickness of up to 200m. When we entered the cave we could see into the ice – it is incredibly clear with rocks and air bubbles suspended within which give an amazing sense of depth. The cave experience was a little strange though. There were some informative displays but also strange coloured lights and even some mannequins dressed in business suits. I couldn’t help but think of it is a little pointless. Before climbing back up the steps Stuart (Claire’s Dad) and I stood watching the bridge for a couple of minutes, hoping to see it move with the glacier. Very quickly we realised that 1cm per hour is so slow that standing in sub zero temperatures waiting for it is a bad idea. The view back up the side of the valley from the Ice Cave. You can see the cable car in the distance. It’s a tiring climb. There has been nowhere near enough food in this here blog lately. I’ll put that right for you now because as I climbed I started to feel hungry. On the train ride back down I mentioned to Stuart that I wanted to track down a cheap burger joint that I had read about. I had always planned to seek out the cheaper eating options in what is a rather expensive town. 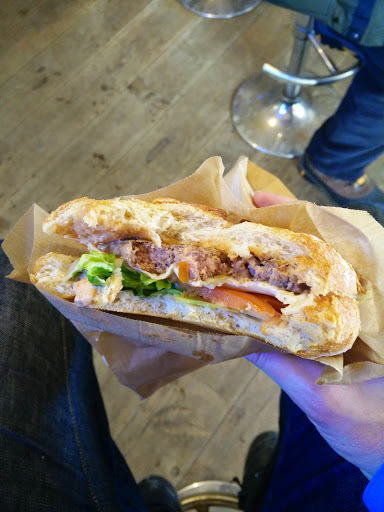 After a while we tracked down the tiny L’Annexe and Stuart, who was not planning on eating a burger as he has far more gastronomic restraint than I, was immediately drawn in by the incredibly large and tasty looking buns on display. The burger was pretty good. Lots of crispy bread and pretty meaty. It was head and shoulders better than the purple burger I had in Barcelona. 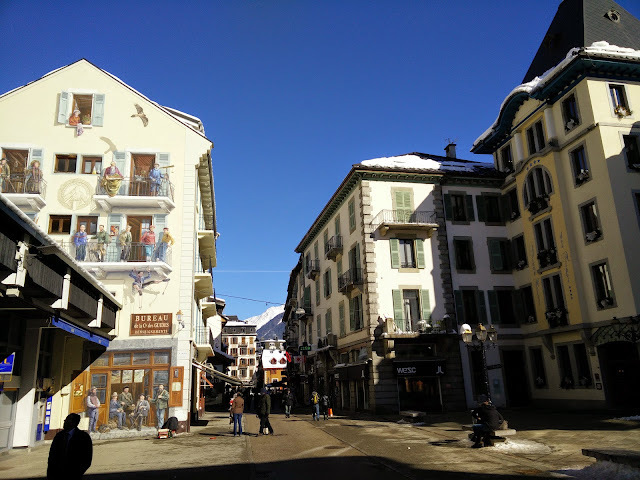 Chamonix as a town is very pleasant. It has lots of pedestrianised streets and shops, many of which are the outdoor pursuits variety, and even more coffee and cake shops. It is my sort of town for sure. Claire and I have visited a few towns and villages around the world that are central to outdoor pursuits. Queenstown in New Zealand (also home of the greatest burger in the world) and Tafraoute in Morocco are two such towns, and Chamonix shares the same buzz. People are either on their way out to do something exciting or returning to celebrate their adrenaline buzzes, which leaves a strange period in the middle of the day when not a lot happens. Many of the shops close for a while. Typically the two times I headed into town to look in the shops I got caught out by this. Fool. Next up. Snowshoeing part 2 and the importance of not being complacent.